How do I create a custom DCM report? 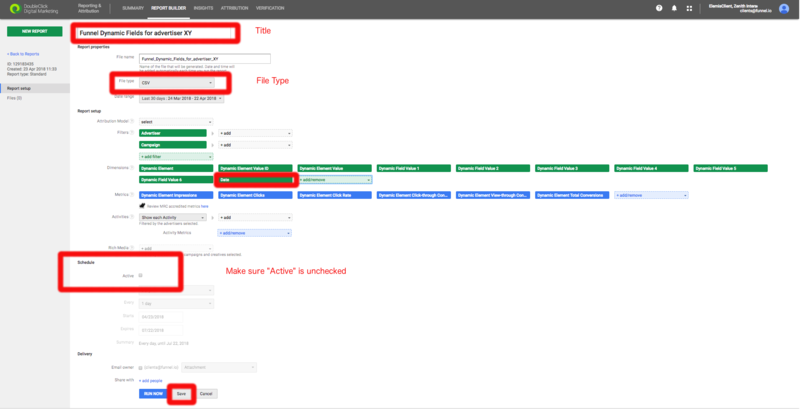 The DoubleClick Campaign Manager in Funnel is set up to connect with specific reports in your DCM account. These reports can be of the basic or custom variety. If you want to connect with a custom report, you first have to create it in your DCM account! Head to the Reporting & Attribution page (or navigate directly to this link) and then click the Report Builder tab in the top navigation bar. Now, you need to prepare a report for Funnel to fetch, you can go with two different options: duplicate an existing report or create an entirely new report. In the Report Builder, click on the NEW REPORT button in the top left. Next, select a template to base your report on. Check the checkbox next to the report that you want to duplicate in the list of existing reports on the Report Builder page. Click on the Choose action dropdown at the top of the list and click "Duplicate". Now that you have your report all set up, you may want to read up on how the Funnel DCM integration works, if you haven't already.